Complementary colours. Cool and warm colours. 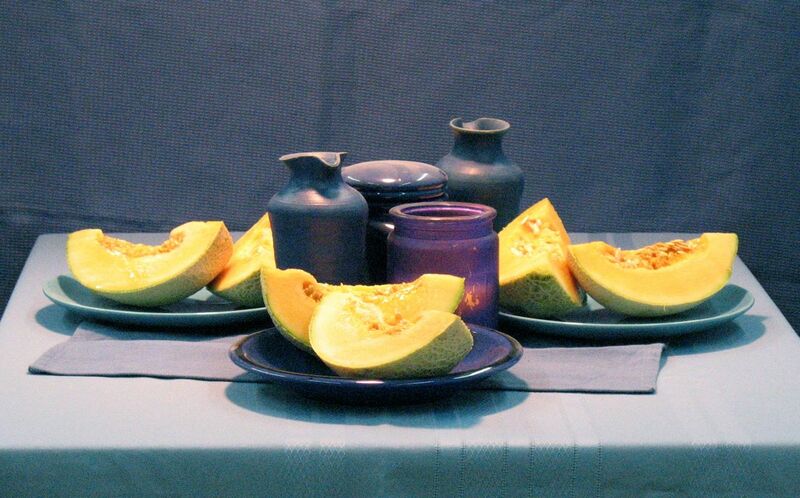 These cantaloupes really glow against the blues and it’s no accident. Their vibrancy comes from the relationship with blue (blue and orange are an eternal love story). 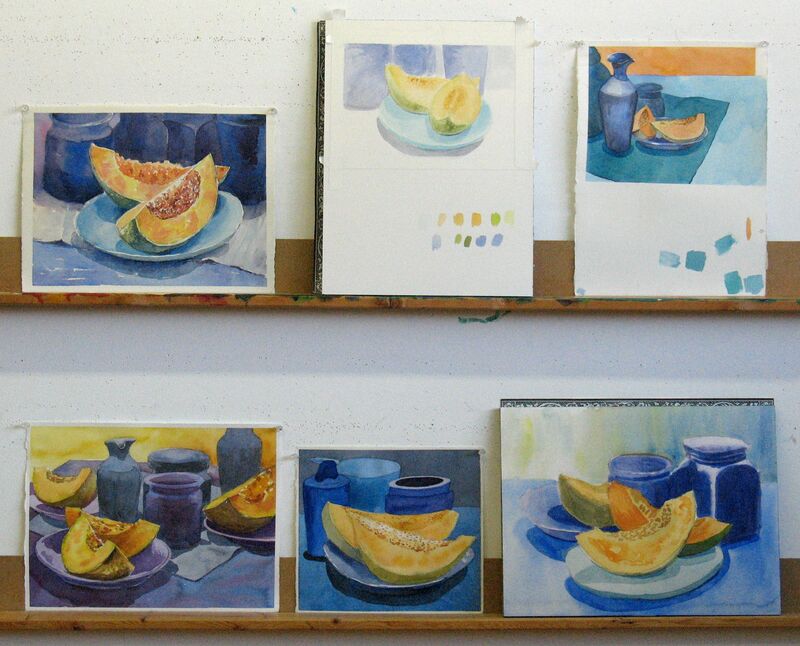 The orange of the cantaloupes advances as the blue objects and fabrics recede. 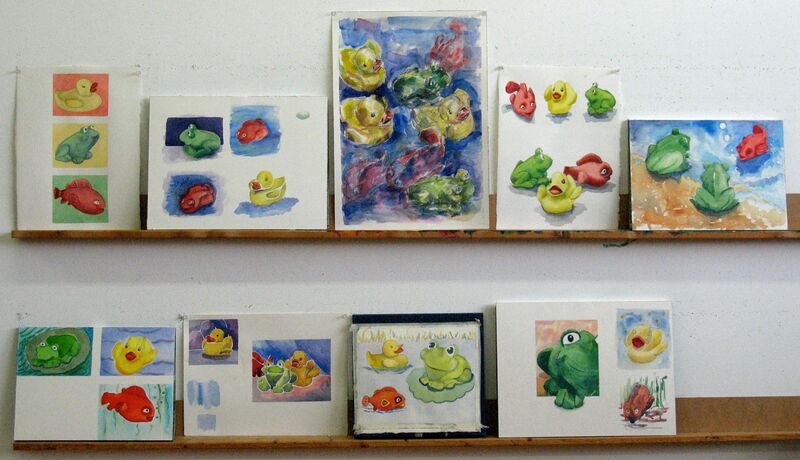 I promised lots of painting time to the students so I kept the demonstration, as much as possible, to the point. First of all, a quick reminder of the change in value for a plane change. I’ve drawn two simplified wedges showing three planes on each. So, three values (in cool gray) give them a three-dimensional quality. 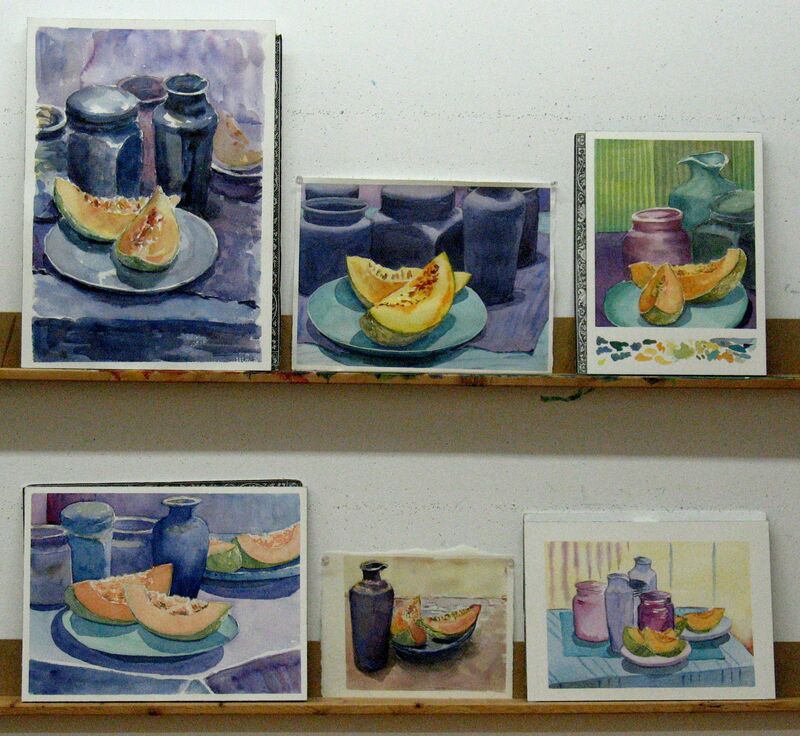 I started the cantaloupes with a light, translucent golden wash throughout the area of the exposed fruit. While wet, I touched in some darker orange and green. 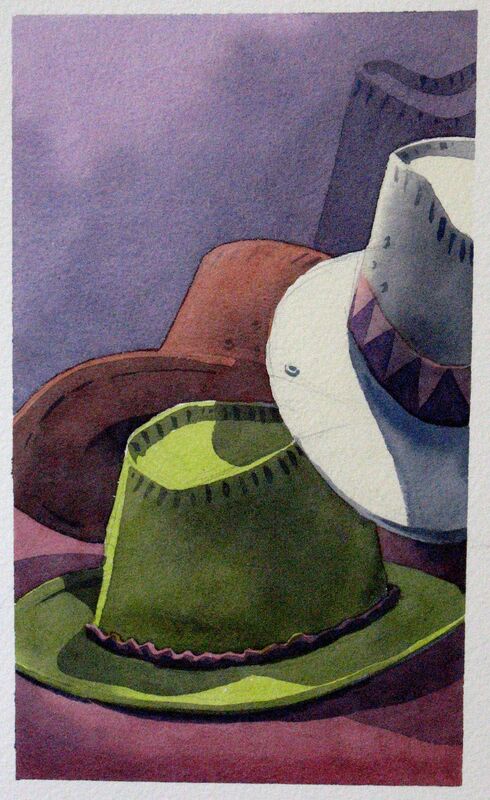 When that was dry I painted the skin an olive green and left a few flecks of paper white to suggest the pitting. Everything was allowed to dry before I painted the seeds and the darker pits in the skin. Light to dark. Big to small. You’ve heard that before here. 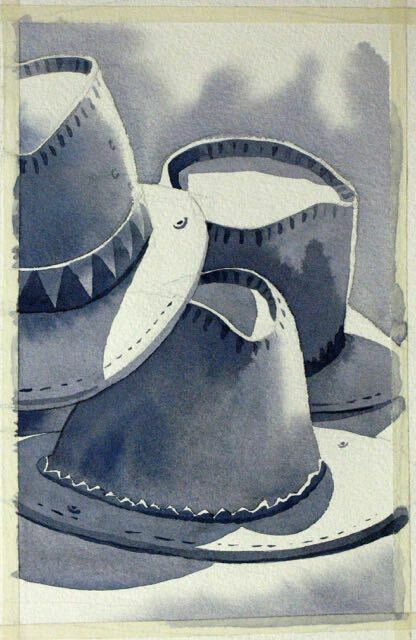 There aren’t as many watercolour paintings to look at today. Various bugs kept several of the painters at home. Here’s what they did! 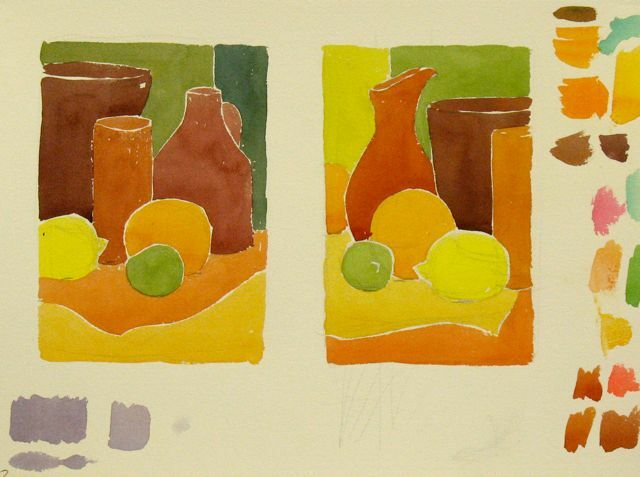 Check out the paintings with warm, yellow or orange, backgrounds. They give the work an interesting sense of space and light. What do you think? A full house was on hand today for our first Sustained Saturday of 2015. 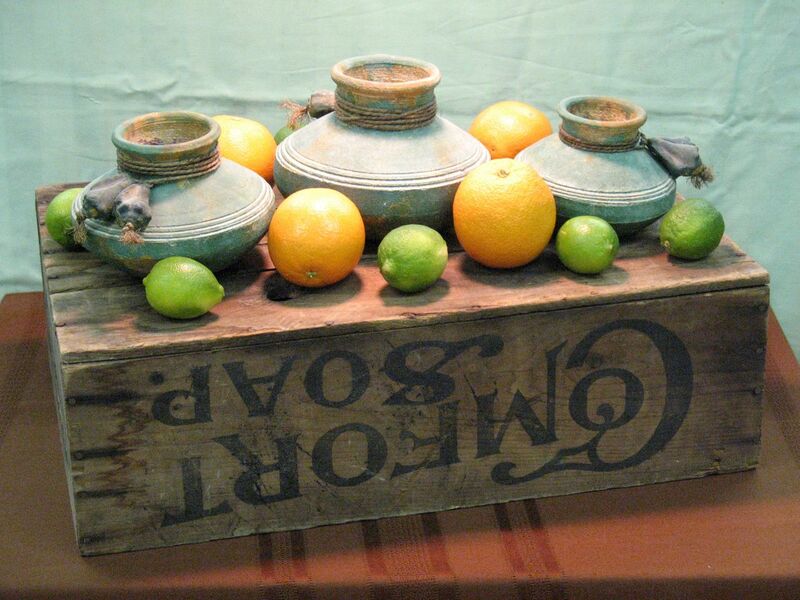 It’s cold and snowy outside so I defied reality and set up a still life with a bit of a southern feel. The soapbox doesn’t necessarily relate to the other objects but it’s an interesting platform for them. My demonstration sheet shows two very different approaches to the pot. 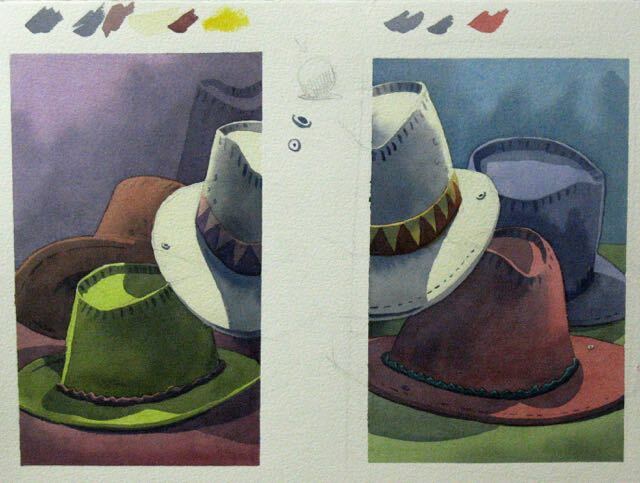 I painted the one on the left with Raw Sienna, darkening it with Cobalt blue in the shadowy areas. 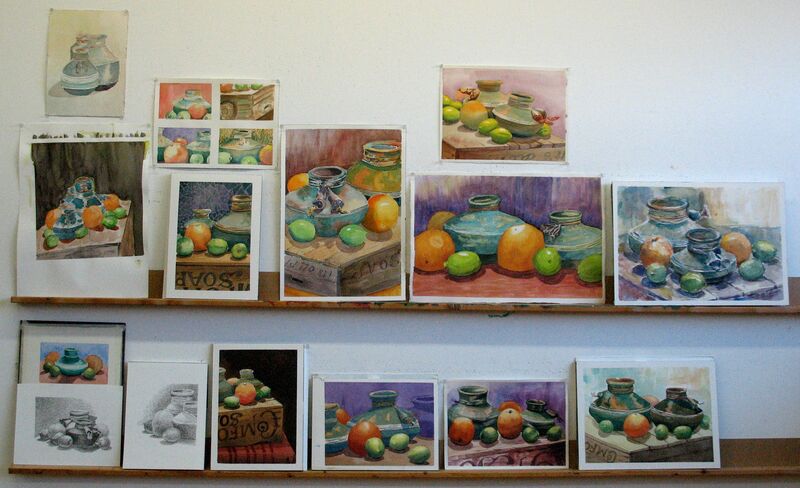 Subsequently, I glazed green over the first washes; not everywhere, of course. 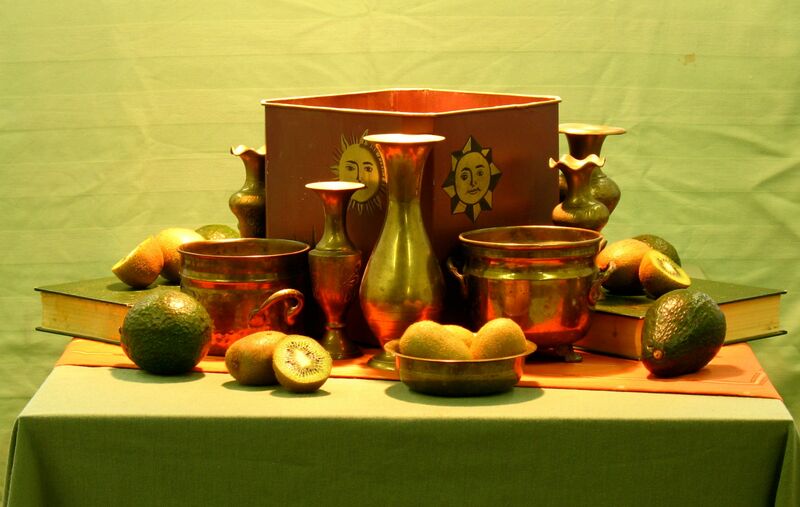 The Raw Sienna is preserved where the colour of the clay shows through on the pot. 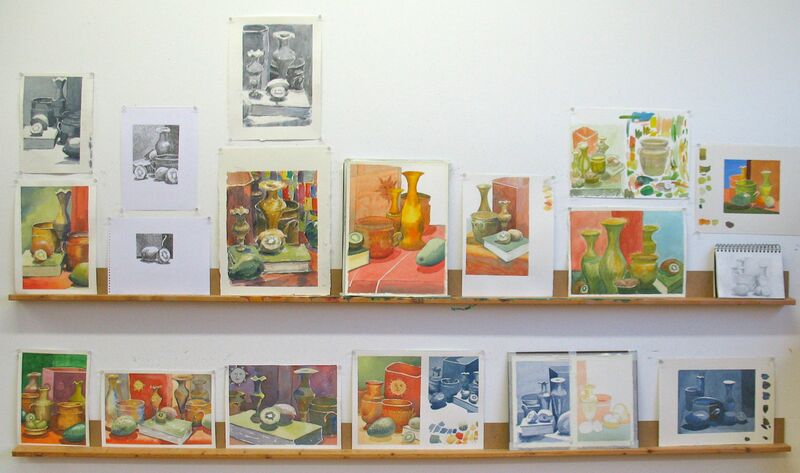 The study on the right was done in a few minutes. Quick, gestural, bold. 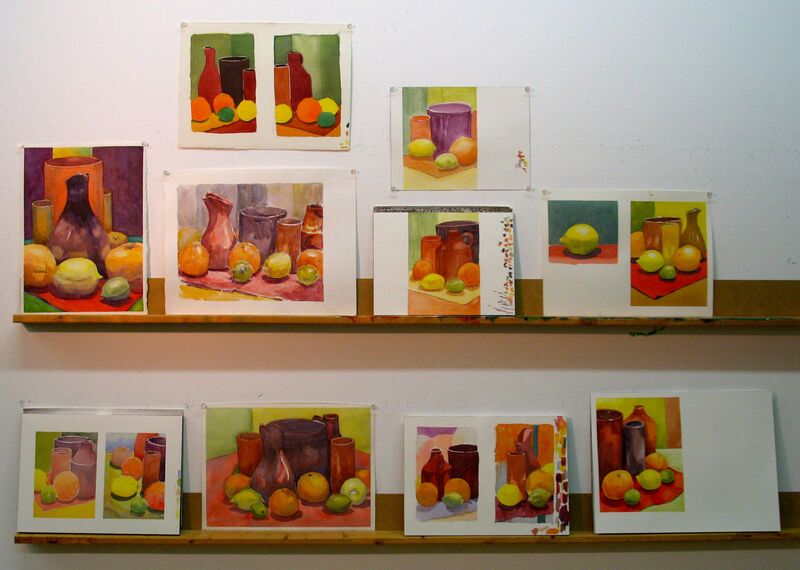 This could be a ‘warmup’ study before starting a sustained work. It could also be a finished piece. The beauty of a Sustained Saturday is time. The class is more than twice as long as a Tuesday morning or evening class. Now, the students will tell you that there’s never enough time, no matter how long the class. I tell them to plan their day, budgeting a certain amount of time for preparatory work and warmup studies. 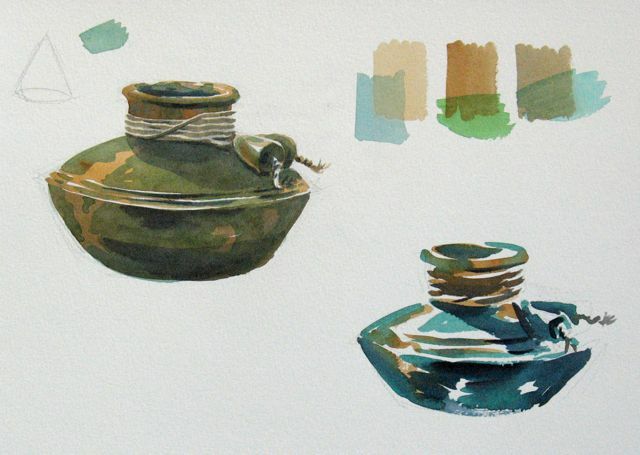 The amount of time they allot for a sustained watercolour is up to the individual. 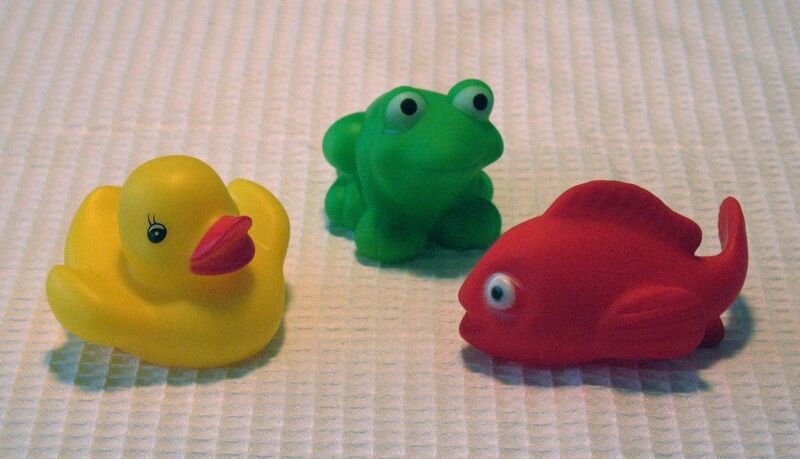 Several of the students felt rusty after the holiday layoff. I don’t think it really shows. It’s been a great start to our new year and a nice antidote to the deep freeze outside. 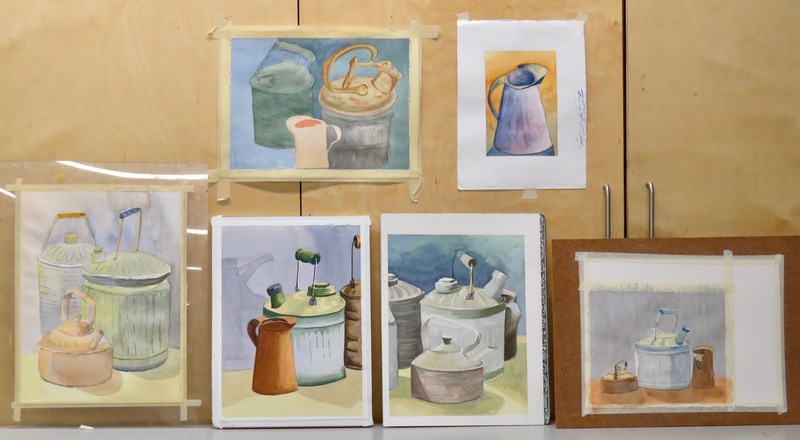 Tuesday Watercolour Class – Week One! Happy New Year! 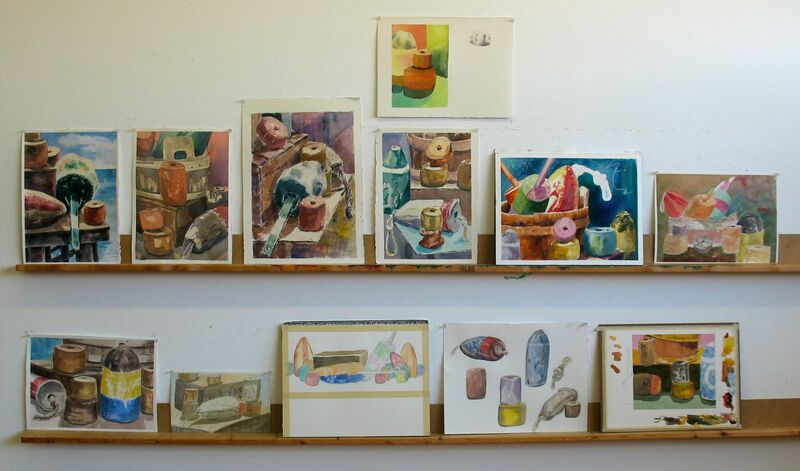 The Tuesday watercolour painters were back in action yesterday. My New Year’s Resolution was to review a few basics. 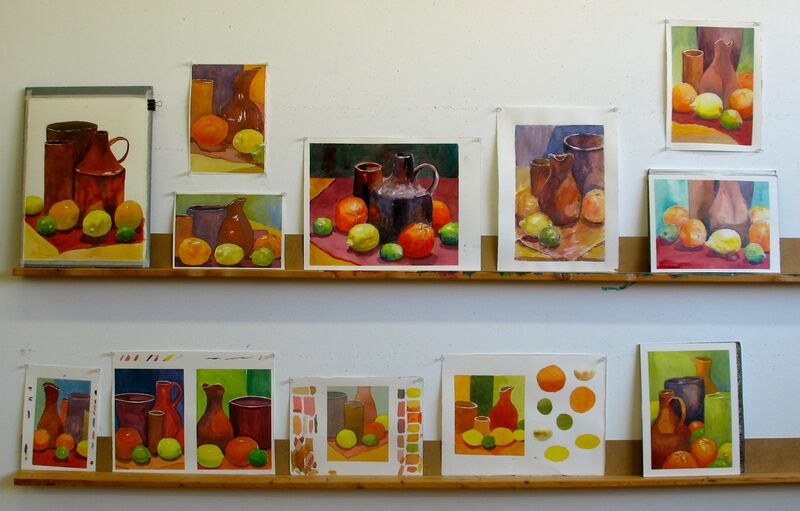 The focus of the two classes was value and we took a very traditional approach to our subject. 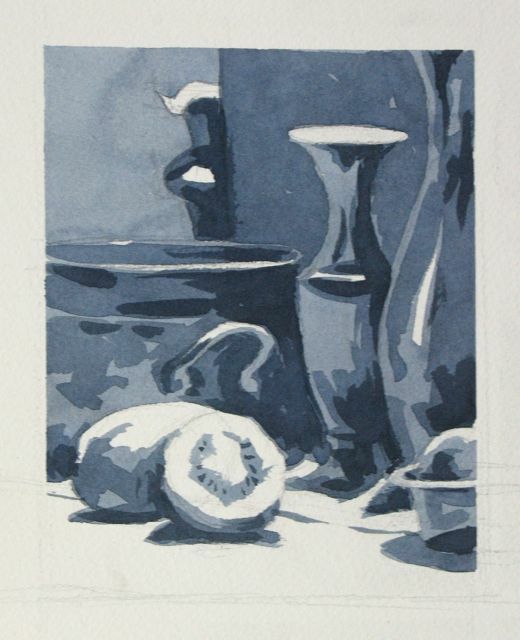 I mixed Cobalt Blue and Burnt Sienna together to make a cool gray. Working from light to dark, I developed the values. I left paper white for the areas of direct light. 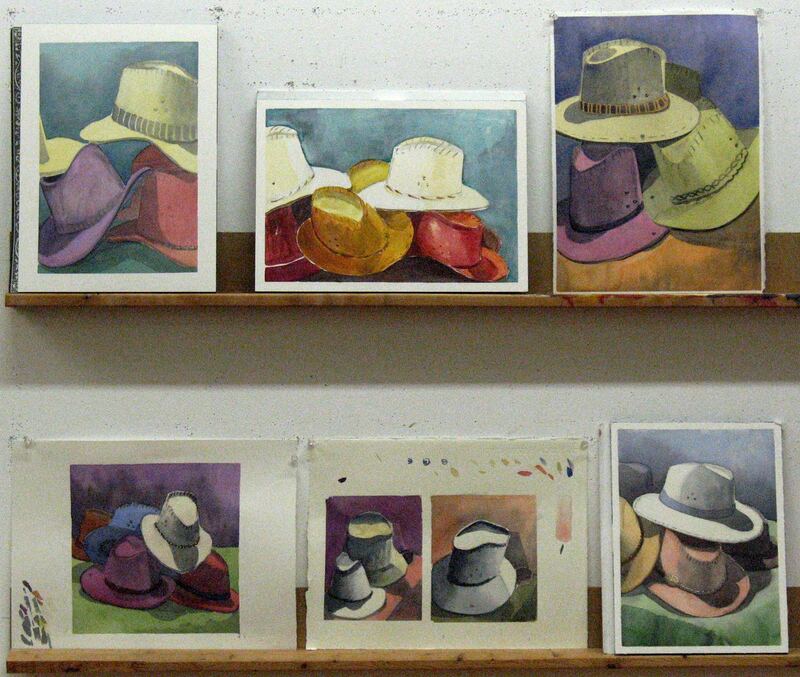 The washes were allowed to dry before I applied the local colour. 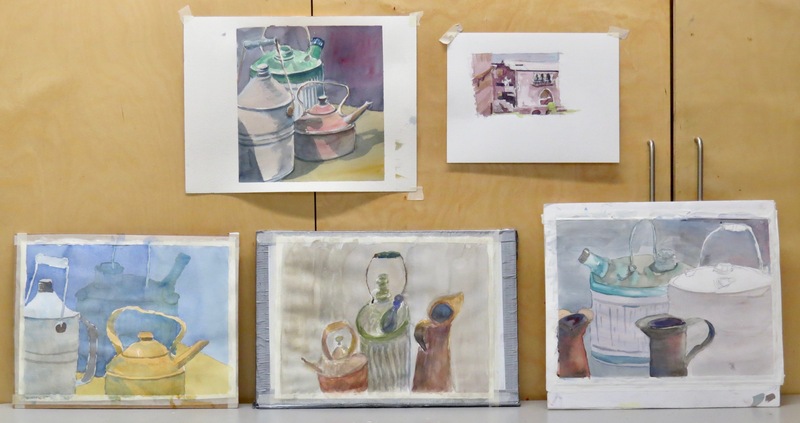 I asked the students to study the values carefully and to take their time. 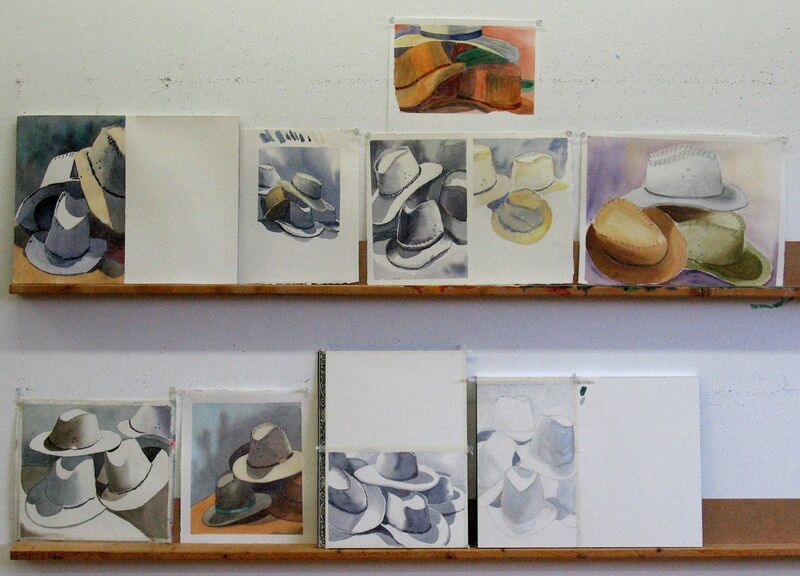 Not all completed the colour stage of the painting but they did a great job of observation. All in all, a solid start to our new term. 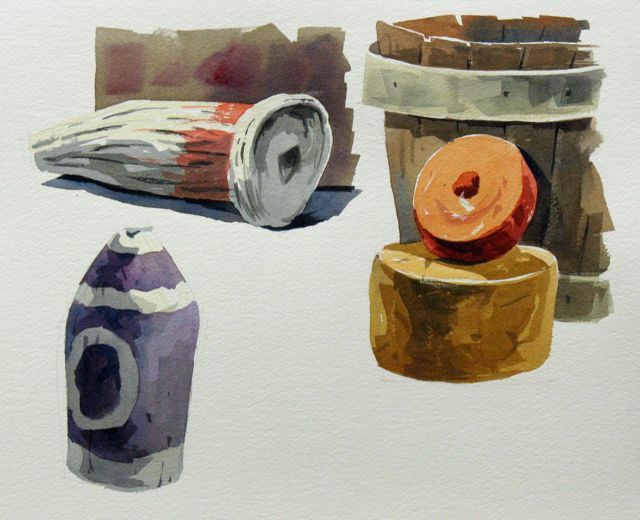 Tuesday Watercolour Class – Week Six – More Fishing Gear! 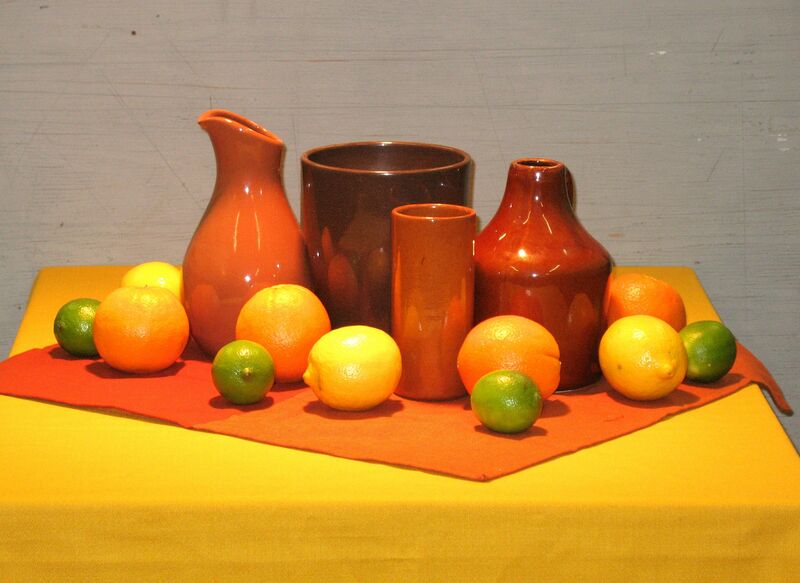 This is another view of the still life I used on Saturday. These rough and weather-beaten objects were the perfect subject for our goals yesterday. 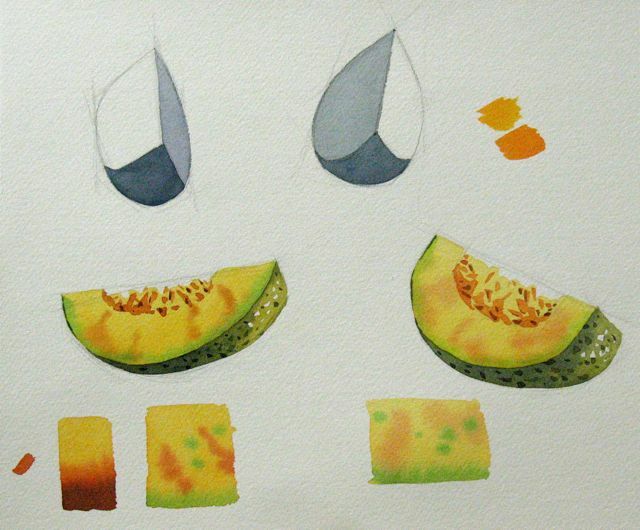 I demonstrated using flat angled watercolour brushes. These brushes are made by several different companies. I prefer the firmer synthetic or sable/synthetic mix brushes. They don’t hold as much water as a natural hair round brush and it requires an adjustment when using them for the first time. As an extension of last Tuesday’s lesson, I used mostly crisp edges and a bit of wax resist, as well. My preliminary drawing was done with simple, broad strokes of a soft pencil; very general and with no detail. I wanted the brush to have a strong role in the painting and not restrict it to simply filling in between carefully drawn lines. 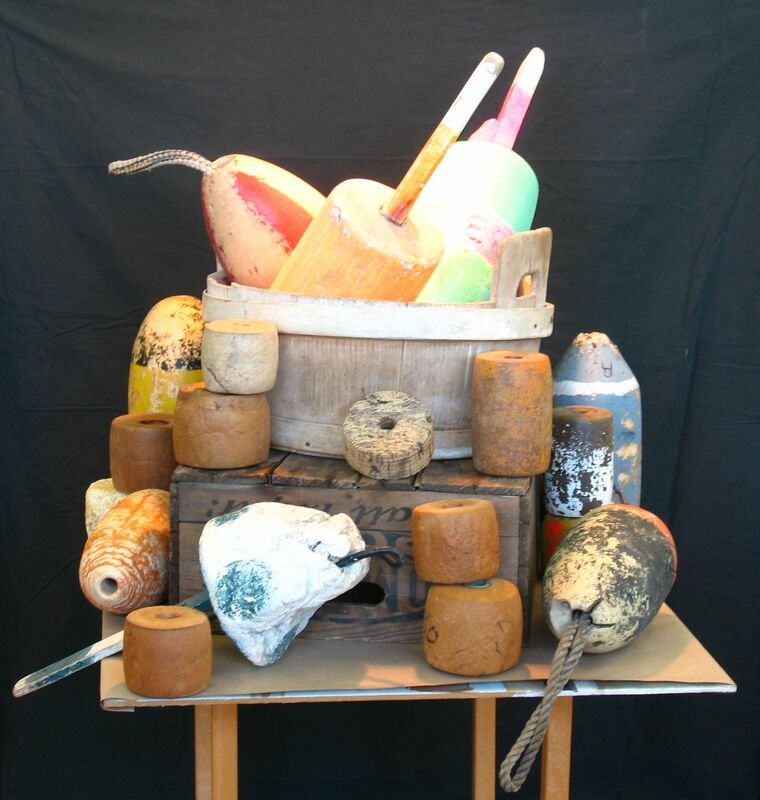 As on Saturday, the Tuesday students brought these old floats to life with some vivid colour. 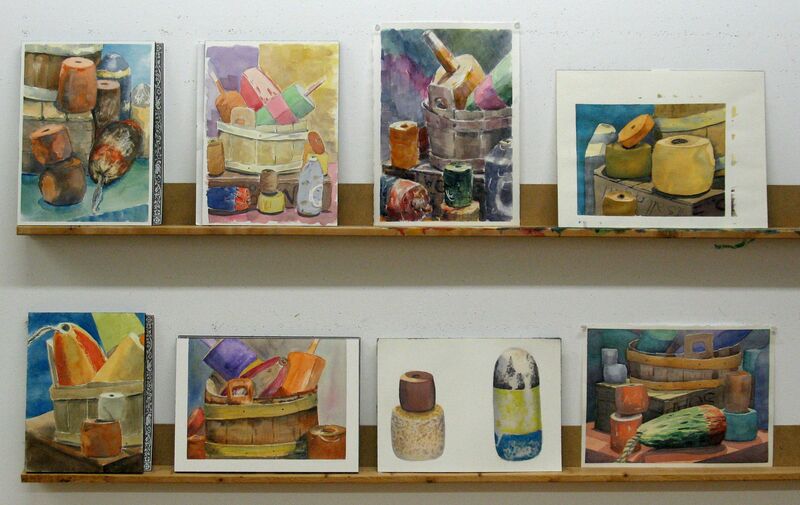 Most tried the flat angled brushes and some experimented quite freely with the wax. I’m going to stick with these versatile brushes for a few more weeks. 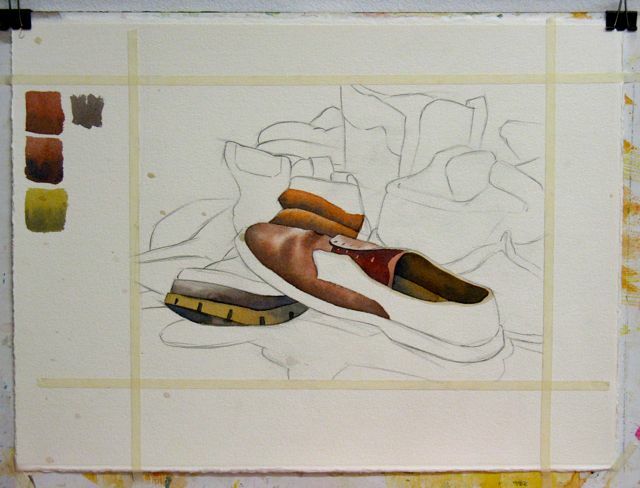 Tuesday Watercolour Class – Week Two – Shoes! 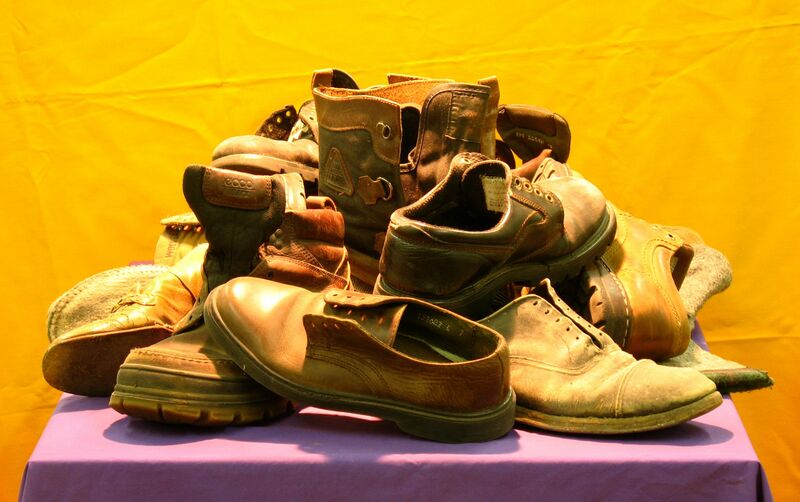 It’s surprising how much fun it can be to paint a pile of old shoes and boots. Fun but not without it’s challenges and drawing is probably Challenge Number One. 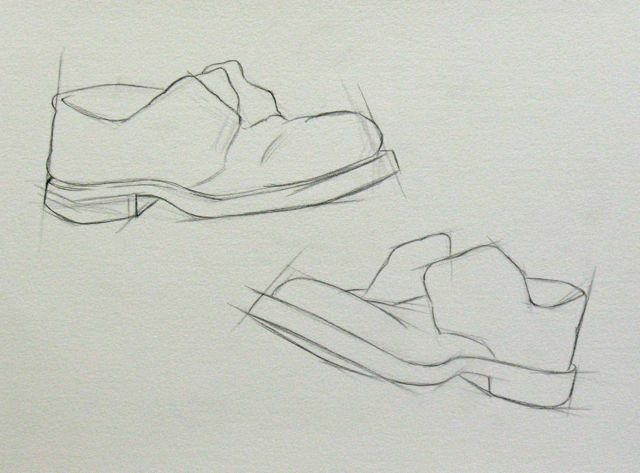 The first sheet shows two shoes drawn with straight strokes only. Lots of light lines are used to find the shape of the shoe. I’ve darkened the lines here for better visibility. Curved strokes are next. 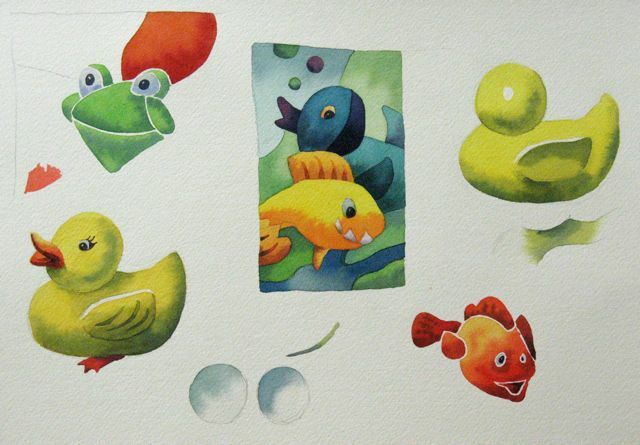 As I draw, I analyze the shapes and try to think about how I will paint them. 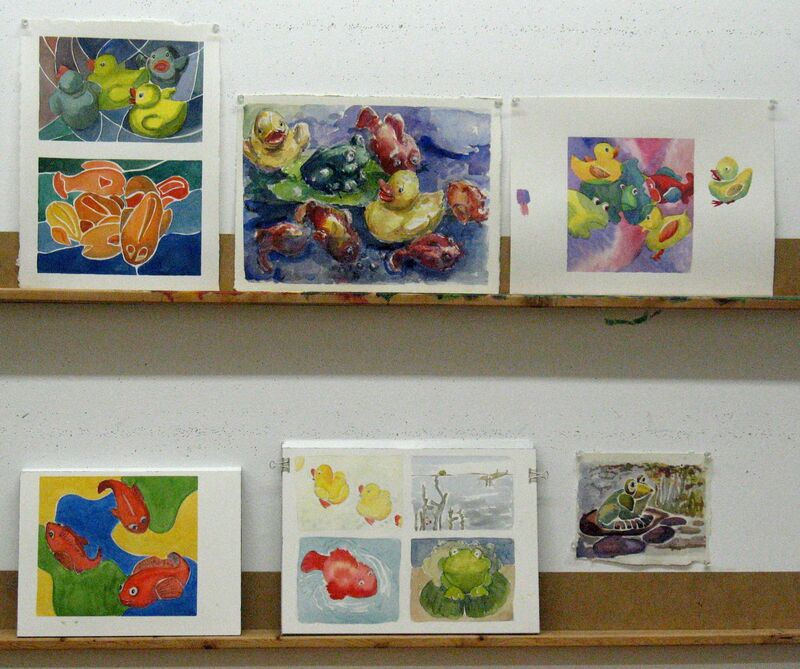 My watercolour demonstration is in progress below. 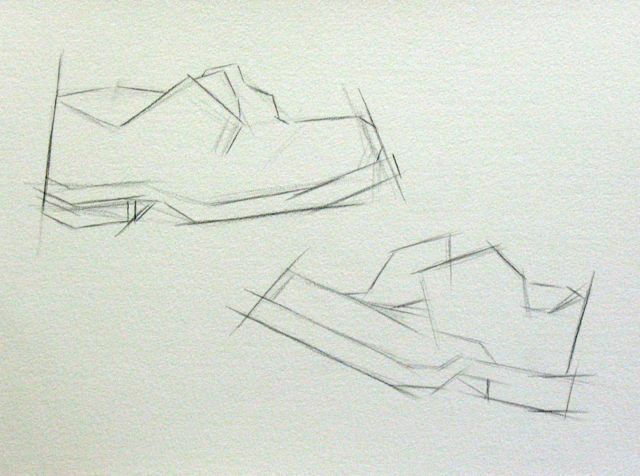 A tightly cropped composition can help us focus on shapes rather than trying to be overly literal about depicting the shoes. It’s important to study edges where shapes touch each other. Can a dark value be used to set off a light area? 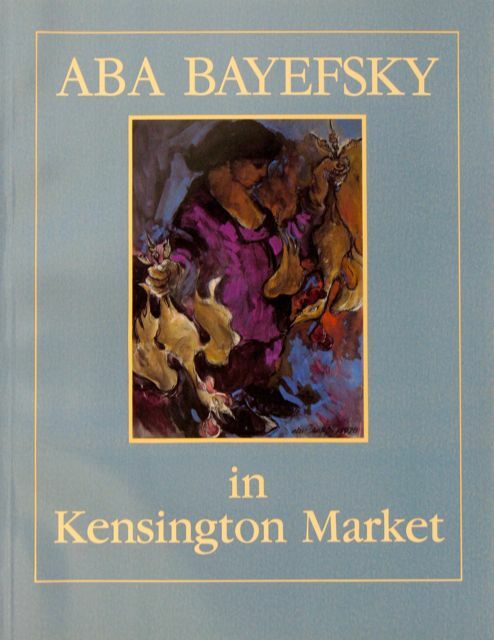 Our guest artist was Canadian painter Aba Bayefsky (1923-2001). Aba had a lifelong love for Toronto’s Kensington Market. 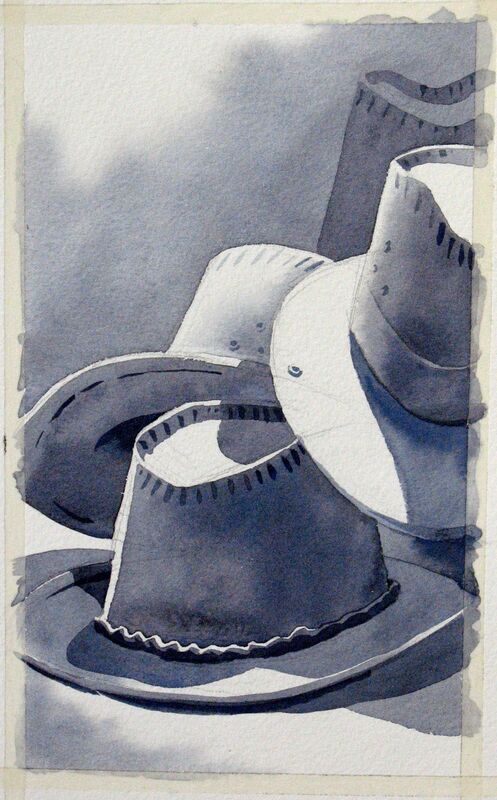 He was one of my teachers at the Ontario College of Art and I remember him for his sense of humour and insights into my student struggles with drawing and watercolour. 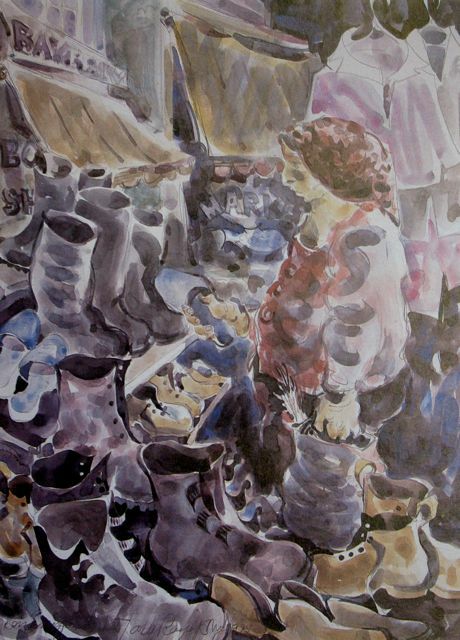 Many of his charming and spirited drawings and watercolours of the lively ethnic Market have been collected in this book from Mosaic Press. 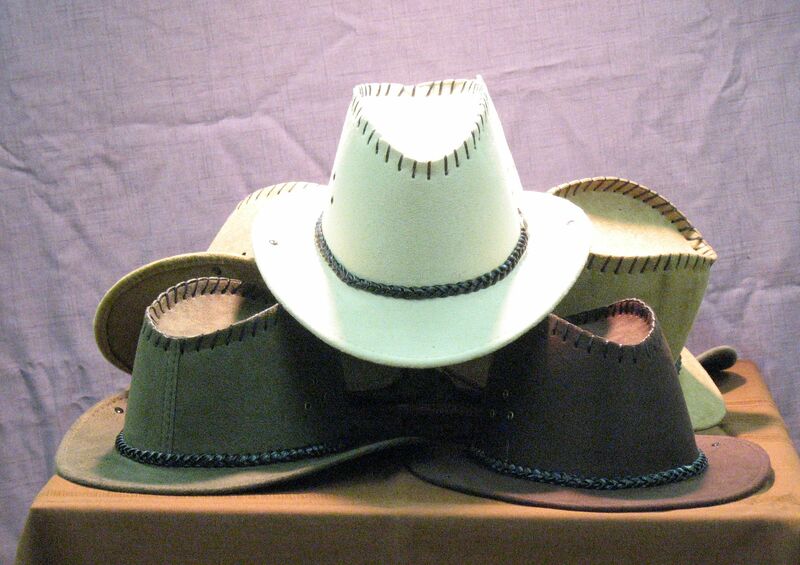 He treats the shoes and boots in a playful manner but his keen observation never wavers. The careful drawing did slow down many of our artists. 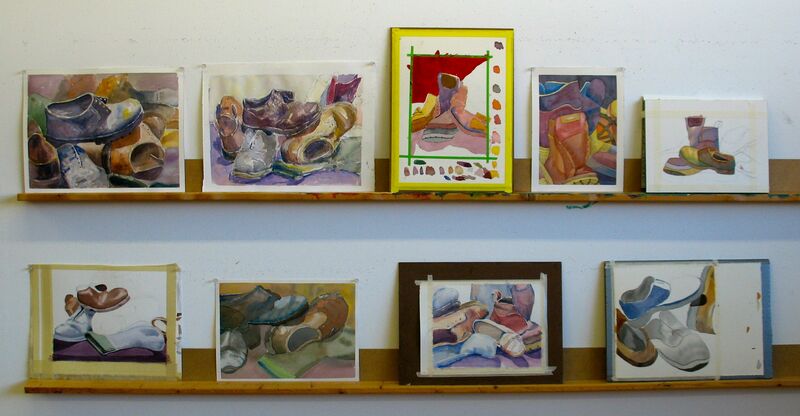 I don’t mind looking at unfinished paintings during our end-of-class critiques. The process is more important to me than the product. 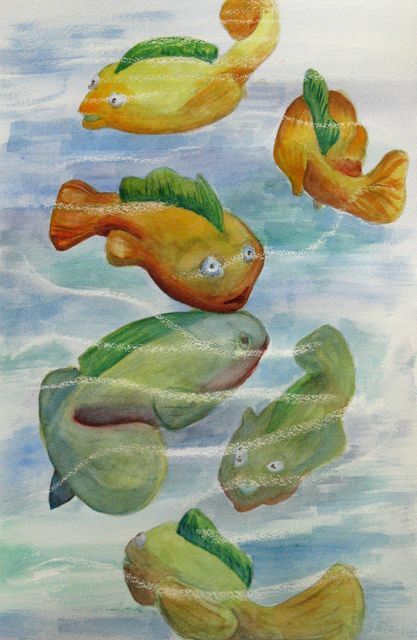 Still, the two classes created some very strong watercolours.